Nadine Sutherland’s career history fits none of the stereotypes commonly attributed to Jamaican popular music stars. She made her stage debut at the age of nine as a winner of Jamaica’s popular Tastees Talent Contest. International reggae superstar Bob Marley, signed her to his Tuff Gong label while she was still an adolescent. Nadine went from being known as reggae’s “Teen Queen” with hits like “Starvation” and “Until” to garnering international acclaim as the co-lead on dancehall anthems “Action” and “Anything for You”. Considered by fans and critics alike to be the premier Jamaican female vocalist of her generation, Nadine continues to fulfill the promise she demonstrated as a child. 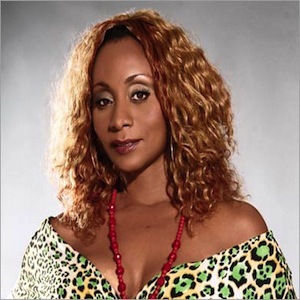 Throughout the 90’s, Nadine Sutherland was center stage in the dancehall with solo hits like “Babyface” and “Wicked & Wild” as well as her collaborations with top deejays including Buju Banton, Mad Cobra, Spragga Benz, and, of course Terror Fabulous and Canadian sing jay, Snow. Hit ballad “Pair of Wings” highlighted Nadine’s songwriting ability. Released near the time of the shocking death of promising reggae singer, Garnet Silk, her earnest and tender performance became the unofficial tribute. The 1997 release of her self-titled album on VP Records further showcased her depth and sincerity as a writer and a performer. The song “No, No (Not My Baby)” is one of the most powerful mother-to-son ballads ever written. Live performances of the song have brought tears to the eyes of the toughest men. 2006 was quite a year for Nadine Sutherland. She conquered stages all over the United States and the Caribbean with her revamped live show that celebrates her more than two decades in the business. Her spirit-filled tribute to Joseph Hill of Culture was a highlight of his memorial service. She also made a return to the charts with her hit singles and videos for “Keep Me Safe” and “Can’t Tek It” (featuring Chrisinti).